Alex is a retail nerd and curious about how digitalisation and innovation can change our lives – as consumers but also as brands and companies. He is the Founder and President of the executive retail network RIO (Retail+Innovation+Omnichannel) at the Swedish Marketing Association in Stockholm, where he also is a member of the executive board. Baker is a frequent guest on the retail scene in northern Europe and speaks about digitalisation in retail and disruption. He was the Chairman of the executive jury for the prize ‘The disrupter of the year’ earlier in 2018, where Swedish tech startup, Karma, won. Baker is also an executive jury member at the Transform Awards Europe in London. 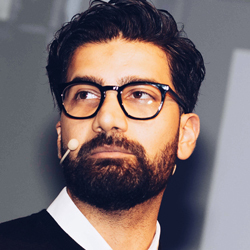 Since November 2017, he has been the Chief Commercial Officer at ClickSys – a Swedish tech startup specialised in digital in-store. ClickSys’s mission is to re-define retail with digital experiences by bridging the gap between digital and physical worlds. Baker is a fan of agile methodology and hypothesis-driven innovation. Before ClickSys he worked for the Swedish retail FMCG giant, ICA, as Head of Concept for Digital In-Store and Innovation.